Unshapely thighs can be secondary to excess skin (often present after significant changes in weight), excess fat, or excess skin and fat. The removal of excess skin does come at the cost of a scar, but Dr. Edward Ye takes every measure to ensure that the incision is closed as meticulously as possible to give you the best possible scar. Dr. Edward Ye ensures that the scar is always placed in the least visible position while still giving you the optimal contour. 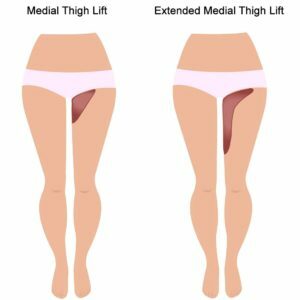 Typically, the scar for a thigh lift is best concealed by placing it in the upper thigh close to the groin or along the inner edge of the thigh. The length and location of the scar really depends on where the excess skin is located. Some patients only have extra fat in their thighs with good skin elasticity and therefore are candidates for thigh liposuction alone where scarring is minimal.